The garage door is a feature of any home that we live in, that we always remember. As children, we may remember how we struggled to open the garage door, to sneak in and rifle through dad’s tools or sporting kit. What we got up to may become a forgotten memory, but the garage doors remain with us. The classic up and over doors bring memories of bumped foreheads or out of balance weights that some doors featured as innovative at the time. Some of us even remember the classic double hinged doors that occasionally still turn up on traditionally themed buildings. 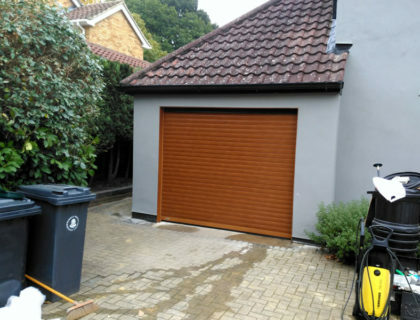 Below are a few examples of roller garage doors that we have installed for customers all over Hampshire, Surrey and Berkshire. 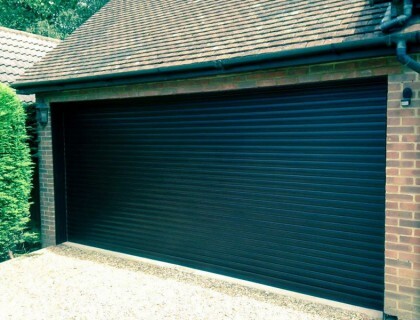 Roller doors, however, have become a preference for several reasons. Apart from the exceptional contribution to space management, modern roller doors make opening and closing so much easier. Seceuroglide™ is perhaps one of best investments a person can make in Roller Garage doors, especially when considering the needs of the elderly. Elderly people typically experience regressive mobility difficulties. Getting around is still important to them and gaining access to their garage falls into a vital part of the independence. With a selection from five different remote controls, there is no more bending or back-breaking nudging required to get into the garage. Perhaps what makes the Seceuroglide™ products even more exciting is that they can also be controlled from a mobile phone. With Connect+ the proud new owner of one of these doors doesn’t have to keep yet another remote control safe. Aside from mobility and access, these doors are police and security approved. These doors are a substantial deterrent to thieves and intruders, who would more readily move on to an easier target. Keeping vulnerable elderly family members safe from intruders is a priority. Those elderly family members that still drive do not have to worry about pulling into the garage so tightly that they nearly take out the opposite wall. Seceuroglide doors provide that extra space to park as close to the entrance as possible. The SeceuroGlide Excel is the only garage door that is Insurance and Police Approved. It has Secured by Design status, which is restricted to companies or products that have been successfully tested to the high standards set by Secured by Design and meet Police Preferred Specification. While security and mobility concerns are at the forefront of our concerns for elderly relatives, we sometimes forget their need for warmth. In homes where the garage is integral to the house, loss of warmth can easily occur through the interleading hallway to the home. Seceuroglide doors have been efficiently designed to reduce the cost of heating because of the unique insulated design of the slats and curtain. This, of course, has a knock on effect with helping to insulate the house within which the garage is integrated. Often practical features require sacrifice on the part of cosmetic appearance. With Seceuroglide roller doors, this is not the case. With a refined finished look, they, in fact, add value not only to the appearance of the home but will add value to the sale price, when the time comes to move on. With alternative manual doors available and different designs to meet the needs of different house styles and sizes, the Seceuroglide door is the perfect option. Having yours fitted by professional, experienced fitters is, of course, a given.